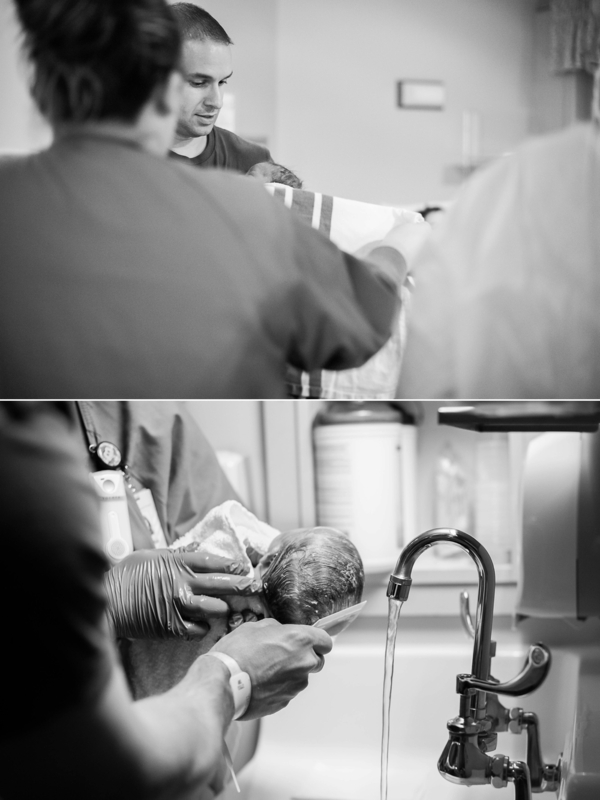 I am really honored to have been a part of this birth story. And what an incredible birth story it is – it’s a story so great that it actually starts waaaaay before the pregnancy did! This is an adorable family. (For real. Jim was actually named the Hottest Dad in America! And clearly, Angela is no slouch herself, either.) When Angela was telling me this story, she said that the most meaningful aspect of the experience of being named the Hottest Dad in America wasn’t the title – it was that Jim got to appear on national tv and talk about how passionate he was about parenting, and to share that message. After getting the opportunity to see Jim with his kids at our Fresh48 session, I have to say that this comes as no surprise. Both Jim and Angela possess that rare quality of being able to see the world through their children’s eyes, and I saw them approach their eldest three children’s first introduction to their new sibling with patience, empathy, and a giddy excitement that could only be called childlike – in the best way possible. But back to the birth! So, Jim and Angela had their three beautiful children, decided they were done, and – well – Jim underwent a certain surgical procedure that is often described as permanent birth control. : ) And some years later, Angela began to wonder if she was having a change of heart. Angela is a photographer based in North Pole (of the eponymous Angela Tritle Photography) and sees a lot of high school seniors, and their parents, in her studio for portraits. She told me that she often ended up chatting with the parents during the sessions – and she was surprised how often she heard them say that they wished they’d had more children. Angela really wanted to make sure that they too weren’t going to experience this regret, and so she and Jim really took it upon themselves to revisit the issue and really, really think about the baby question. As you may have already guessed given the nature of this post, it soon became clear that yes, they did want to pursue having more children. It was a long journey, but from that point, they maintained faith that the pieces would fall into place and that they would find a path to their dream. And fall into place they did, including a trip out of state for a surgical reversal. And that was how I ended up in a coffee shop with Angela when she was about eight months pregnant, glowing, and very, very excited. Angela had a natural, drug-free birth planned and had arranged to labor in the hospital’s tub if circumstances permitted. Her previous three labors had been relatively quick, so when I got the text that she was in labor, I was ready to fly into action. And I stayed ready…for hours! To everyone’s surprise, this little girl was taking her time. I finally joined them at the hospital in the evening and had a lovely time hanging out with Angela, Jim, and Angela’s sister, who was there to take video. Though she still was only dilated to about 3 cm, the contractions were starting to get uncomfortable, and the CNM gave the go-ahead to get into the tub. It was there that labor soon began in earnest, and the amazing relationship between Jim and Angela really began to shine. Jim stayed by Angela’s side every second and was absolutely her rock – calm, steady, supporting, and strong. It was amazingly poignant to watch. After an early labor that poked along for an entire day, Angela’s labor was suddenly moving fast, and it became incredibly intense – so much so that during transition, Angela was left literally gasping for breath. At one point, she dilated almost three centimeters in the 40 minutes between checks – crazy fast. Later, she said it felt like she was being split in two. All we could figure is that baby finally decided to shift her position, and once she did, she was on her way down! It was around this time that Angela asked for an epidural. It was so amazingly intense. However, it was clear – to everyone in the room except for the woman in labor – that there was no way an anesthesiologist would be able to get there before the baby did! Luckily, however, her CNM appeared and was able to tell her just how close everything was – and suddenly, carts were being wheeled in willy-nilly and Angela was about to meet her baby. Emily Scarlett was born en caul (being born “in the caul” refers to an amniotic sac that remains intact through birth) – in a scant few pushes she was in her mother’s arms. The room was full of joy, and the rosy squalls of a beautiful baby with a fuzzy head of hair.